HMS Iron Duke is the fifth vessel of the Type 23 Duke Class Frigates. Image courtesy of Royal Navy. The primary role of HMS Iron Duke is anti-submarine operations. Image courtesy of Royal Navy. HMS Iron Duke is based at Portsmouth Naval Base. Image courtesy of Royal Navy. Iron Duke is fitted with a wide range of weapon systems, including the Sea Wolf surface to air missile system. Image courtesy of Royal Navy. HMS Iron Duke entered dry dock to undergo a major refit. Image courtesy of Royal Navy. The next generation Wildcat helicopter was tested aboard the HMS Iron Duke in January 2012. Image courtesy of Royal Navy. HMS Iron Duke has been fitted with the Artisan 3D medium range radar as part of the refit. Image courtesy of Royal Navy. HMS Iron Duke has been put to extensive sea trials to test her systems and safety equipment after the refit. Image courtesy of Royal Navy. HMS Iron Duke is the fifth frigate of the Royal Navy’s Type 23 Duke Class Frigates. She was launched in March 1991 and commissioned in May 1991. The ship is the third vessel in the Royal Navy to bear the Iron Duke name. The vessel’s primary role is anti-submarine operations, but she can also conduct a wide range of operations including disaster relief and surveillance. She is based at the Portsmouth Naval Base. HMS Iron Duke is currently undergoing a major refit aimed at upgrading her command and control and weapons systems. She is scheduled to return to the navy’s fleet and resume operations in mid-2013. "HMS Iron Duke is currently undergoing a major refit aimed at upgrading her command and control and weapons systems." HMS Iron Duke entered the dry dock at Portsmouth in March 2012 for her five-year refit programme. The upgrade will ensure the ship is ready for future naval warfare. Major components of the upgrade include work on the weapons and combat systems, and living conditions. The vessel has been fitted with a new Artisan radar from BAE Systems. The radar will enable her to carry out operations around the globe. The living conditions have also been improved, by providing better ventilation in order to enable her to operate more efficiently in hot climates and also comply with stringent maritime pollution controls. The ship’s crew returned onboard in March 2013 after the 11-month refit. The ship will now undergo extensive sea trials to check her systems and safety equipment before resuming operations. HMS Iron Duke has a stealth design which masks her radar signature. The frigate is 133m long, with a beam of 16.1m and a draught of 7.3m. The displacement of the vessel is 4,900t. The ship can accommodate 181 personnel. 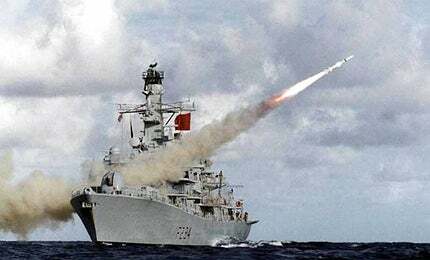 HMS Iron Duke is equipped with a wide range of weapon systems. These include the 4.5MK8 medium calibre gun for shore bombardment, two vertical launch Sea Wolf surface to air missile systems, Harpoon anti-ship missiles, Stingray torpedoes, a DLH decoy launch system, 30mm medium calibre gun, two automated guns, two mini guns, Magazine torpedoe launch system and a towed array subsurface detection system. HMS Iron Duke is propelled by a CODLAG (Combined Diesel-electric and Gas) propulsion system, including two Paxman Valenta diesel generators, two GEC electric motors and two Rolls-Royce Spey boost turbines. HMS Iron Duke can sail at a maximum speed of 28kts or 15kts on diesel-electric propulsion. It has a maximum range of 7,800 nautical miles. HMS Iron Duke carries the Merlin Mk1 helicopter, which can be used in a variety of roles. A prototype Wildcat helicopter, which is a successor to the Lynx helicopter, underwent extensive trials aboard the ship in January 2012 for 20 days. The Wildcat helicopter is scheduled to serve all Royal Navy frigates from 2015. "HMS Iron Duke is equipped with a wide range of weapon systems." The trials, completed in February 2012, were part of an evaluation programme aimed at testing the capabilities of the helicopter. HMS Iron Duke is the first frigate is in the Type 23 class to be fitted with the ARTISAN radar from BAE Systems. The radar has been fitted as part of the refit programme. It is also part of the Royal Navy’s £100m programme to equip its frigates, ships and Queen Elizabeth Class aircraft carriers with the radar. The new radar replaces the Type 996 surveillance radar. The Artisan radar, designated as Type 997, can monitor more than 800 objects simultaneously. It is constructed of lightweight carbon glass fibre. The radar has a range of 200m to 200,000m and weighs 700kg. The radar has the capability to detect anything as small as a tennis ball travelling at three times the speed of sound. The UK Ministry of Defence issued an invitation to tender in July 1987 for an amphibious helicopter carrier for the Royal Navy.